Sweepstakes Period: The Sweepstakes begins at 12:01 a.m. CST on 4/10/2019 and runs through 11:59 a.m. CST on 5/12/2019. 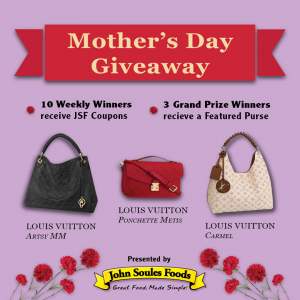 Prizes: 10 winners of John Soules Foods coupons for free product, and 3 Grand Prize winners of a featured purse. John Soules Foods, Inc. reserves the right to cancel, terminate, modify, or suspend the Sweepstakes at any time. Requirements: No purchase or payment is necessary to enter or win. Sweepstakes entrants are not required to opt in to John Soules Foods marketing communications to enter. Sweepstakes is subject to applicable U.S. federal, state, local and municipal laws and regulations. Void where prohibited or restricted by law. Entering and Personal Information: To participate in the Sweepstakes, log on to the John Soules Foods Facebook page (http://www.facebook.com/johnsoulesfoods), Twitter account (https://twitter.com/johnsoulesfoods) or Instagram account (https://www.instagram.com/johnsoulesfoods), find a promotional post from April/May 2019 and comment below the post to enter to win. Entrants are limited to one (1) entry per Facebook, Twitter or Instagram account during the Sweepstakes period per day. Alternate entry methods will not be allowed. As a condition of entering this Sweepstakes, you will be asked to provide certain personal information about yourself, such as your name, email address, and physical address. Unless required by law, John Soules Foods will not share your personal information without your permission with any unaffiliated third parties. Eligibility: The Sweepstakes is open only to legal residents of the United States of America, 18 years or older at the time of entry. Employees of John Soules Foods and their immediate family members are not eligible to participate in the Sweepstakes or win prizes. The term “immediate family members” includes spouses, parents, grandparents, siblings, children, grandchildren, and persons with whom the employee is domiciled. Odds: Sweepstakes odds depend on the number of people who enter the Sweepstakes. The winners’ names will be selected at random. Notification: Winners will be notified of their prizes via Facebook, Twitter or Instagram private message. If a potential winner cannot be contacted, does not respond within five (5) days, or John Soules Foods’ notification is returned as undeliverable, the potential winner forfeits all rights to the prize, and John Soules Foods may select an alternate winner. Prizes will be delivered to winners via standard shipping by standard carrier. Winner Acceptance: The winner may waive his or her right to receive a prize. Prizes are non-assignable and non-transferable. The winner is solely responsible for the reporting and payment of any taxes on prizes. As a condition of receiving a prize, a winner acknowledges that failure to comply with any term or condition of these Official Rules may, at the sole discretion of John Soules Foods, result in winner’s disqualification and the forfeiture of his or her interest in the prize. Except where prohibited, participation in the Sweepstakes constitutes a winner’s consent to the publication of his or her name in online promotional announcements and other promotional material from John Soules Foods and to the inclusion of his or her name in any other related publications or websites for any commercial or promotional purpose, without limitation or additional compensation. The winners’ names may be obtained by sending a request with self-addressed, stamped envelope to the attention of John Soules Foods Big Game Giveaway Marketing Promotion at P.O. Box 4579, Tyler, TX 75712. Participation: Participation in the Sweepstakes constitutes an agreement by each entrant to comply with these Official Rules. John Soules Foods reserves the right to cancel or modify the Sweepstakes if it determines, in its sole discretion, that fraud or technical failures have destroyed the integrity of the Sweepstakes. Limitations of Liability: By entering the Sweepstakes, contestant agrees that: (1) any and all disputes, claims, and causes of action arising out of or connected with the Sweepstakes or any prizes awarded shall be resolved individually, without resort to any form of class action; (2) any and all claims, judgments and awards shall be limited to actual out-of-pocket costs incurred by the claimant, including costs associated with entering the Sweepstakes but expressly excluding claimant’s attorneys’ fees; and (3) under no circumstance will any entrant be permitted to obtain any award for, and entrant hereby waives all rights to claim, punitive, incidental or consequential damages and/or any other damages, other than for actual out-of-pocket expenses, and any and all rights to have damages multiplied or otherwise increased.